Freedom Pizza is the go-to place for pizza cravings of my entire family. We have ordered from Freedom Pizza several times as they not only serve pizzas that are healthy but tasty too. We love their menu as it offers innovative pizzas, amazing salads, sides and oh-so delicious desserts. I have tried most of their gluten free and vegan desserts. Freedom Pizza sources the best ingredients. The crust of the pizza is a multigrain blend, that is made up of whole grains and seeds to slow digestion and provide maximum nutrients. They only use all-natural-cheese, natural herb infused sauce, organic produce and hormone free chicken. All their desserts are handmade right here in UAE. Every now and then they keep introducing something new in their menu. Recently they introduced Vegan sausage and couple of dairy free and gluten free desserts. So glad that we vegetarians and vegans have an option of ordering a sausage. You can add it to the pizza of your choice by customizing your toppings. Mexican Chipotle flavored vegan sausage is a spicy-hot blend of smoked Chipotle peppers, Chili de Arbol peppers, fresh chopped garlic, sweet onions seasoned with cumin seed and oregano. It is dairy free, but does contain gluten. When you order a pizza from Freedom, you can build your own pizza-by picking the size, crust, sauce and toppings or opt for their signature pizzas. 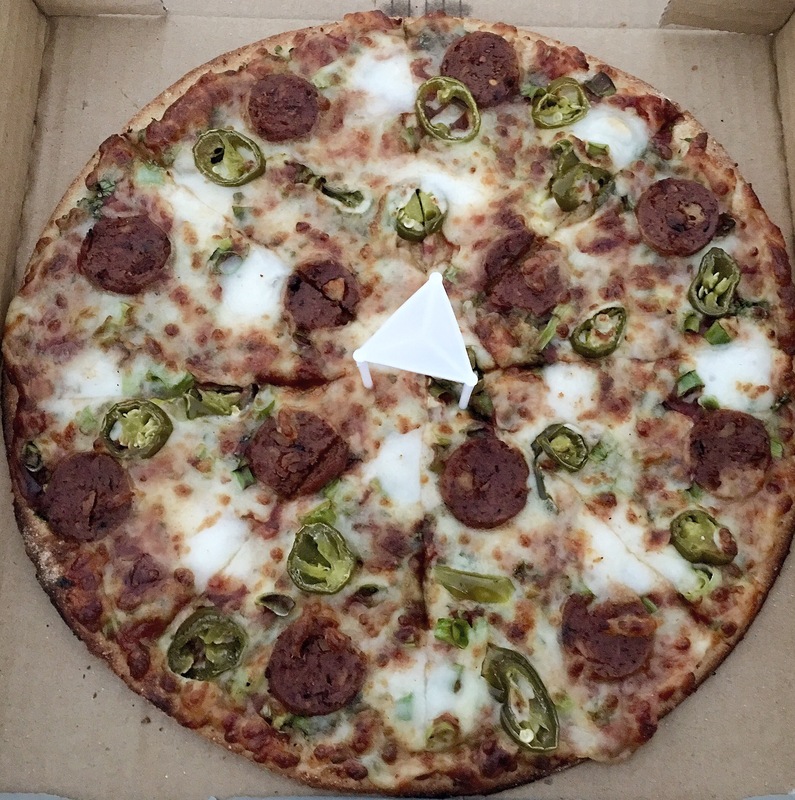 I ordered their medium, thin crust signature pizza-Nacho Libre(without meat) and asked them to add vegan sausage as the topping. We relished the pizza with the vegan sausage. The sausage was slightly spicy, well seasoned, tender and tasty. Yes, we found our favorite topping-Vegan Sausage! Next we tried the newly introduced Awesome Rawsome Banoffee. 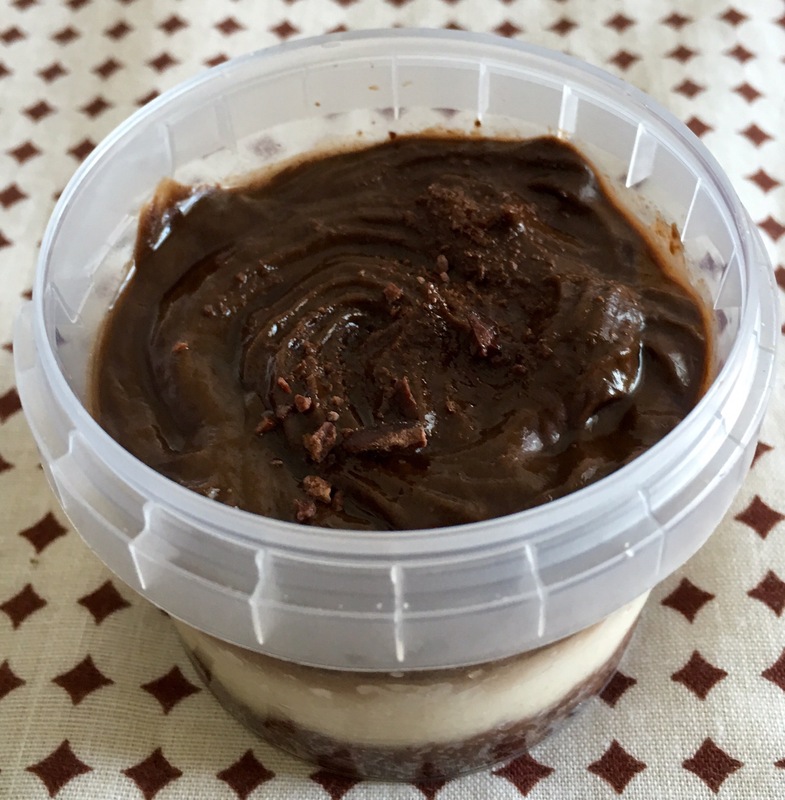 It is a dairy free and gluten free dessert with a chewy almond crust layered with cashew cream and bananas that was topped with avocado cacao mousse, shavings of raw chocolate and cacao nibs. Didn’t even imagine that a dairy free Banoffee can be made and can taste so delicious. 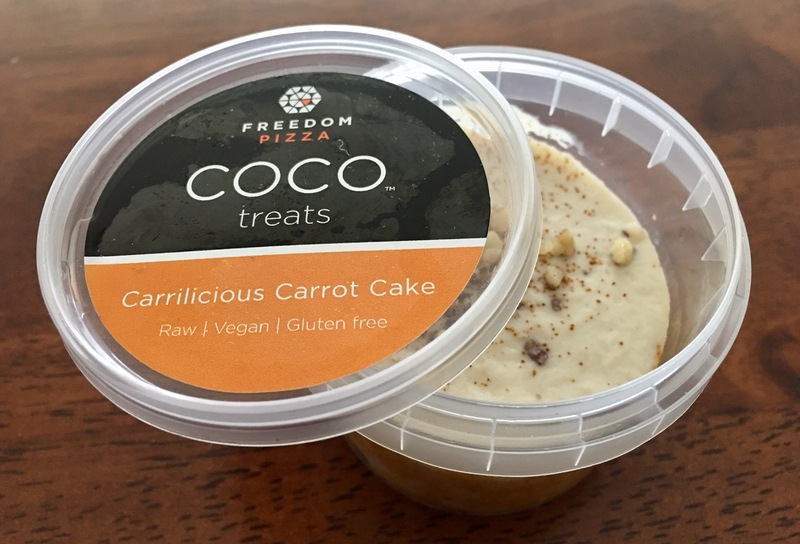 Carrilicious Carrot Cake is another new dessert that I tried from Freedom. This was an amazing gluten free, dairy free, refined sugar free and vegan dessert that I’ve tried. I loved the hint of orange on the top. A must-try for all those carrot cake lovers. Vegan Ice Creams are new in their menu. They have introduced 3 flavors-chocolate, strawberry and vanilla. 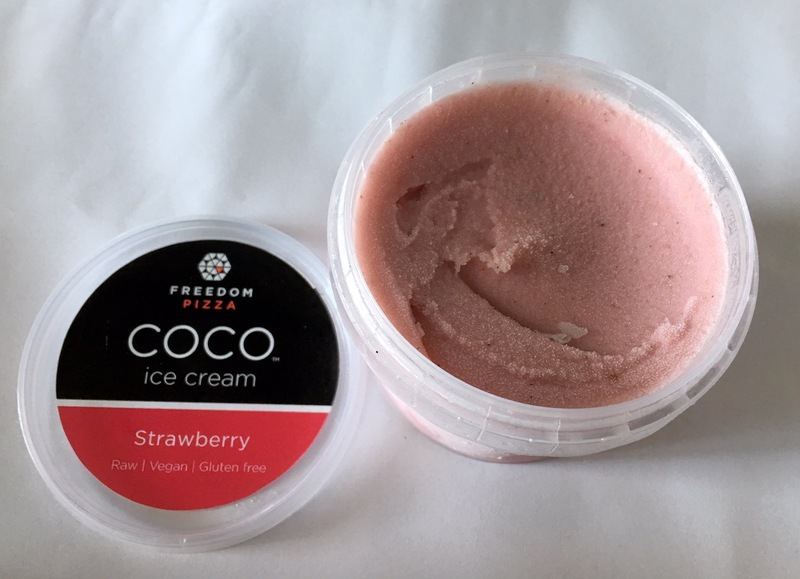 We tried the strawberry flavor-it was a delicious blend of pure coconut cream with fresh strawberries. It was fantastic, can’t wait to try the other 2 flavors. Freedom Pizza delivers anywhere in Dubai within 3o minutes. Make sure to try the new food items in their menu. Have you tried the newly introduced items in their menu? Let me know your thoughts on it. Call them at the nearest branch around you!